This book is at once an exploration, a celebration, and a little-known tale of unity. It presents 150 delicious vegetarian dishes that together trace a fascinating story of culinary linkage. As renowned cookbook writer and teacher Najmieh Batmanglij explains, all have their origins along the ancient network of trade routes known as the Silk Road, stretching from China in the east to the Mediterranean in the west. On this highway moved not just trade goods but also ideas, customs, tastes and such basics of life as cooking ingredients. The result was the connecting and enrichment of dozens of cuisines. 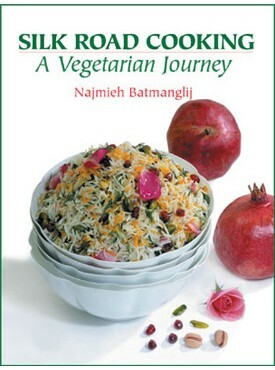 In Silk Road Cooking: A Vegetarian Journey, Najmieh Batmanglij recounts that process and brings it into the modern kitchen in the form of recipes that are venturesome and yet within reach of any cook. They are intended for vegetarian, partial-vegetarian and non-vegetarian alike — anyone who is looking for balanced, unusual and exceptionally tasty dishes. The book offers a wealth of information derived from the author’s extensive research and her travels along the Silk Road during the past 25 years. She complements the recipes with stories, pictures, histories of ingredients, and words of wisdom from her favorite poets and writers of the region. The scope of her culinary journey of discovery is vast — from Xian in China, to Samarkand in present-day Uzbekistan, to Isfahan in Iran, to Istanbul in Turkey, and to the westernmost terminus of the ancient trade routes in Italy. Her recipes — all of them personal favorites — include such exotic yet simple fare as Sichuan Crispy Cucumber Pickles; Afghan Boulani, a savory pastry stuffed with garlic chives; Persian Pomegranate and Walnut Salad; Kermani Pistachio and Saffron Polow with Rose Petals; Chinese Hot and Sour Tofu Noodle Soup; Turkish Almond and Rice Flour Pudding; Uzbek Candied Quince with Walnuts; and Sicilian Sour Cherry Crostata. Fortunately, all the ingredients for these recipes can be obtained at local supermarkets and farmers markets. In recent years America has become a kind of modern Silk Road, where wonderful ingredients from all over the world are available to everyone. “…SILK ROAD COOKING: A VEGETARIAN JOURNEY (Mage Publishers, $35) is like a good novel — once you start, it’s hard to put down. It is ideal for those who like to read cookbooks as much as cook from them. The author, Najmieh Batmanglij, who was born and raised in Iran and lectures at cooking schools, begins by describing the ancient network of trading routes stretching from China to the Mediterranean. As Ms. Batmanglij explains, along with the trade in silk, ivory and other goods came cooking techniques and ingredients that enriched and transformed local cuisines. Beautifully illustrated with photographs of food, people and places from along the Silk Road, the recipes include notes about their origins and ingredients. Come join me on a voyage of culinary discovery, along a path that stretches through the ages and across half the world, from China in the east to the Mediterranean in the west. The path is the ancient network of trading routes known today as the Silk Road. Cooking traditions are often defined in geographic terms; a cuisine may be associated with a particular province, for instance, or a country or perhaps a wider region such as the Mediterranean. To speak of Silk Road cooking is to invoke spaces and distances far greater, continental in scope. But while the unity is more elusive, it is very real, created by exchanges so slow and subtle as to be almost imperceptible. For centuries — along with the silk, ivory, incense and other trade goods flowing over the vast network — vegetables, fruits, grains and cooking techniques passed from one civilization to another, to be absorbed and transformed into local specialties. This process of mutual enrichment shaped the cuisines of far-flung cultures in profound ways, especially their vegetarian dishes. It is one of the great stories of cooking — yet one of the least known. The sweet, sad tones drew me to the brightest room in our house, where, sitting on the Persian carpet striped with light and color from the sunshine that seeped through bamboo shades, I found my mother and four or five old ladies, all distant relatives. From the crisply ironed white cotton cloths being spread over the carpet and the captivating aroma of fresh dough, I knew it was noodle-making day. “Come on in,” said the old ladies, tearing off a piece of dough for me to play with. They were kneading dough and rolling it into rectangles on large wooden boards. When they had rolled it thin, they folded each sheet twice; then, with one hand as a guide and working with fast, confident strokes, they used sharp knives to cut their dough sheets into quarter-inch strips. The room would fall silent as they concentrated on the task, joyfully competing to see who could cut the most even strips in the shortest time. I Make men and women heartsick with my sigh . . .
Just as quickly as it had started, the singing would stop. Tea would appear, and there would be some gossip, a few new jokes, lots of laughing. Then, as if on cue, everyone would go back to work. One of the old ladies would give me some strands of the fresh noodles to arrange, carefully separated for drying, on the floured cotton sheets. I found myself as delighted by the cheerful ceremony of preparation as by the reward for the work. The next day, convivial crowds of relatives would come to our house for a glorious lunch of noodle soup garnished with fried garlic, onion, mint and sun-dried yogurt. Such pleasurable memories inspired me years later, when I turned to a more serious study of cookery. I began with Persian foods and dishes, and the traditions behind them. Later, in France and America, I learned techniques from other cuisines. Later still, I traveled to such countries as China, Uzbekistan, Afghanistan, India, Turkey and Italy, growing ever more intrigued by commonalities and connections in their cooking. One universal rule seems to be something I first noticed in Iran: The food in restaurants — the food that visitors see as characteristic of a culture — often is only a small sampling of the dishes people eat at home. When contemplating the cookery of Iran or of the Middle East, for example, most Westerners think of meat kabobs, which certainly are popular fare, especially as street food and for celebrations. But Persians eat meat sparingly at home and, as in every other culture, save extravagant meat dishes for special occasions and grand festivities. On the other hand, they prepare a wide range of grain, vegetable and fruit dishes, delicious creations barely known outside of the country. I found the same contrast between restaurant and home cooking in every place I visited. In Iranian home cooking, a meal always begins with bread, cheese, and whatever vegetables and herbs are freshest in the garden or market that day. They are spread out for the family or any guests who may appear, and to them may be added salads and various yogurt-based dips for the bread. Then there are stuffed vegetables; fragrant kukus, or vegetable omelets; and soups. Vegetable markets and vegetarian dishes in all the countries once traversed by the Silk Road offer the same painterly displays, varied fragrances and intense tastes. In markets in Uzbekistan, I found huge melons of surpassing sweetness and vibrant orange carrots unlike any others. I saw nan, the familiar flat bread of Iran, cooked in a tandoor (clay oven) or on a saaj or taveh (a convex cast iron plate placed over a fire). Sold from wooden carts, the flat loaves — known as nan there, too, as well as in India, Pakistan, Afghanistan, much of central Asia and western China — are scented with onion, garlic and sesame, cumin or nigella seeds. Across the world in Xian I reveled in the vast outdoor market, its stalls groaning under bright persimmons, pomegranates, big red jujubes, aromatic ginger, onions and leeks. Such cornucopias are also to be found in Istanbul, Genoa — indeed, almost everywhere — and the wonderful produce, fresh from the earth, stalk, vine or branch, has come to the markets of America, too. The foods made from this bounty appear in infinite variety. Consider only meze, that tempting assembly of little dishes found throughout the Middle East and into Spain (where they are called tapas). Appealing arrays of this kind are also spread out in the unpretentious cafes, or lokantas (from the Italian locanda, meaning ?inn?h), that one finds in every Turkish town. In the warm weather people sit outside, helping themselves to dolmas (stuffed vine leaves), vegetable tempuras, the marvelous pastries called boreks and — my favorite, which also made the imam faint, as its name says — imam bayaldi. There is something about stuffing an eggplant with onion, garlic and tomato that endows its flesh with a most subtle sweetness. The story of Silk Road cooking has a strong vegetarian focus, partly because various early religions that spread along the trade routes encouraged vegetarian diets (see pages 221-223), but chiefly for economic reasons: vegetables, fruits, nuts and other vegetarian ingredients were more affordable than meat. This has a happy corollary: As we are now frequently told by doctors, a diet that includes plenty of vegetables and fruits is a healthy way to eat. For that reason alone, the cuisines that evolved along the Silk Road offer rich rewards to modern-day cooks. Ingredients are only part of the story, of course. Ideas for preparation naturally accompanied the constituents themselves. The noodles of my childhood are a case in point. In the course of my journeys, I found them everywhere — and in China I saw the making and serving of noodles elevated to art. A noodle master of northern China, in what looks like sleight of hand, can stretch and swing a lump of dough into perfect individual strands in 15 minutes. And the sauces and soups that enhance these noodles exist in as rich a variety in China as they do in Italy. Such mastery would seem to support the old legend that Marco Polo brought noodles from China to Italy in the thirteenth century. Recent archeological and linguistic scholarship shows, however, that the transfer was much earlier, and in both directions, east and west. Today, food scholars agree that pasta probably originated in Persia. The first pasta dish is recorded in a tenth-century Arab cookery book, Kitab al tabikh va islah al-aghdhiya al makulat, which calls it by the Persian word lakhsha (which means ‘slippery’) presumably because of the slipperiness of noodles. In eastern Iran, Afghanistan, Uzbekistan, Tajikistan, parts of western China, and Indonesia, they still use a variation of the name lakhsha to refer to a dish that uses wide, flat strips of dough. The same book also mentions that the dish was invented by the Persian Sasanian king Khosrow (Khosrow 1, 531-579). It was probably the Arabs who introduced noodles, and the hard durum wheat necessary for making it, to Italy in the ninth century via Sicily and Genoa. No one knows exactly how the technique for making pasta reached China. What can be said with certainty is that before the Han dynasty (202 bce-220 ce), that country lacked the mills for large-scale flour grinding. Such mills appeared as China expanded to the west via the newly explored Silk Road, and Han cooks soon adapted or invented a vast array of “noodle foods,” as they were called by writers of the time. By the end of the dynasty, China already had developed the technique for swinging dough into individual strands. These were boiled and served with a range of seasonings, and although they were generally considered common food, they were so delicious that even the emperor ate them. Other pasta foods of China include dumplings, steamed buns and little wheat cakes. Some were invented by ordinary people, a third-century chronicler reports, and some came from foreign lands. The many types and many names of Chinese noodle foods offer the sorts of clues that delight linguistic scholars, who find hints of food origins in the wanderings of words. Among the Chinese favorites, for example, is man ty?Nou, a steamed, sweetened, bread-like bun. The term appears in Iran and Afghanistan as mantu; in Japan as manzu, a steamed dough with a filling; and in Korea as mandu, a kind of ravioli filled with beef. Tibetans make stuffed dumplings in a variety of shapes and call them momo. In central Asia, manti is a small steamed pasta that may contain meat, vegetables, or cheese and is served with yogurt or vinegar; in Turkey and Armenia the same word refers to a small stuffed pasta shell poached in broth or steamed. Although some suggest a Central Asian origin for such dishes, no one knows for sure. What is more important than the origin is that the dishes and their names are all related. They form a culinary bond — a sign of early and peaceful communication — that links distant and sometimes hostile cultures. It is a curious fact that the noodles that reached culinary heights in China and Japan, not to mention Italy, occupy only a humble place in the cookery of their Iranian home. Rice, on the other hand, is the same story in reverse. The grain, cultivated in China and India for at least 5,000 years seems to have reached Persia only in the fourth century bce. It did not begin to play an important part in Iranian cookery, however, until the eighth century. Since then, rice has become something special in Iran. It is not the anchor of a meal as it is in China but the basis of festive and elaborate dishes called polows. As you will see in the rice chapter (pages 135-171), a polow may be cooked with a golden crust; it may be flavored with tart cherries, quinces, pomegranates, barberries or candied bitter orange peel; it may include pistachios, almonds, walnuts or rose petals. Like other good dishes, polow has spread far beyond its Persian source. Under such related names as pulaw, plov, pilaf, and pulau, and with such additions as chickpeas and raisins or onions and carrots, it graces celebrations from Afghanistan to Albania, and from India to Turkey. Similar tales linking east and west, north and south, could be told for rice pudding, bread, bulgur and dozens of other preparations based on vegetables, grains, fruits, herbs and spices. It is this rich mosaic — each piece related but distinct — that I have explored during the last 25 years. But let us begin at the beginning and tell a traveler’s tale. . .